Carrie Nardini, a Pitt alum, couldn’t find a place to promote her own art — so she made her own. “I was making jewelry and couldn’t find a lot of outlets at the time to sell my work,” Nardini said. In 2007, she teamed up with another artist named Nina Barbuto and started I Made It! Market. “I met Nina Barbuto at a craft fair at CMU and we started talking and decided to do it. It’s been running since that time,” Nardini said. I Made It! Market produces and organizes indie craft markets. From July 10-12, it’s producing the 11th annual SouthSide Works Exposed artist’s market in SouthSide Works. I Made It! Market recruits, organizes and promotes the artists who are a part of the event. The SouthSide Works Exposed market features handmade art and crafts from local artists, along with a variety of live entertainment and food trucks. I Made It! Market has produced the event for the past seven years. I Made It! Market also runs market events like the Whole Foods Market in Wexford and a market at the Three Rivers Regatta. The SouthSide Works Exposed market features handmade art from different genres and mediums, including jewelry, glassware, photography, clothing, wood-working and more. Nardini graduated from Pitt with an undergraduate degree in English writing in 1998 and a graduate degree in business administration in 2003. She said that she and her I Made It! Market team look at the different artists that apply and decide if each artist’s work is in line with the market’s aesthetic. Through the market, artists get exposure and an opportunity to make a profit on their works. In return, artists pay a vending fee to the market to cover overhead costs like rent, utilities and advertising. I Made It! Market also organizes a number of other events in Pittsburgh, like “Neighborhood Flea,” which runs once a month on Sundays throughout the summer in the Strip District. According to the “Neighborhood Flea” website, it is a flea market which aims to bring together quality vendors with their customers. The market encourages dialogue between vendor and consumer by choosing vendors who create or curate their own collections. This enables the customer to learn from the seller, who has intimate knowledge of the products they’re curating. The SouthSide Works Exposed market features many artists, but focuses on local artists around Pittsburgh. 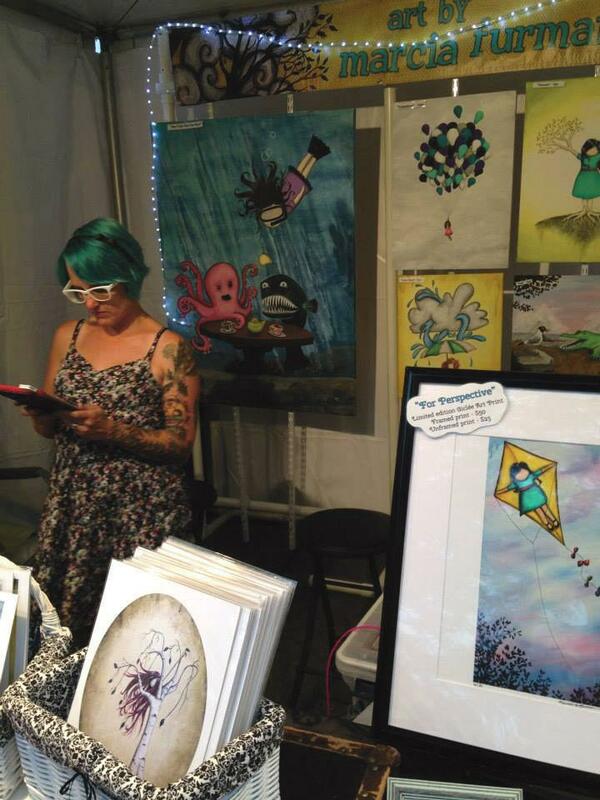 Some artists, like Amanda Lee, plan on showcasing art that focuses on the city. She designs hand-painted glassware, such as wine glasses, shot glasses and mugs, which feature many different designs representing Pittsburgh. Themes in her popular “Steel City Collection” include the Pittsburgh skyline and famous bridges. The collection has sold more than 30,000 glasses in four years. Lee said she’s never embodied the “starving artist” stereotype. Instead, she has always found a way to sell her art, including through the SouthSide Works Exposed market. For Lee, the SouthSide Works Exposed market has given her business lots of exposure. “I did my first [Exposed market] last year and not only were sales great there, but I continued to get business in my storefront in Oakmont throughout the year,” Lee said. Other artists use the market to give them an opportunity to have personal, face-to-face interactions with customers. Artist Colleen Harmon explained that the market gives her an opportunity not only to grow her ceramic business, but to interact with customers, new and old.